«©NCSX» Bayonetta was/is a hot game. We're still replaying it. Whenever a new Bayonetta-related product is announced, we'll order it for ourselves even if we don't bring it in for mass consumption since there's a global recession going on and yadda yadda yadda. Even if a company is crazy enterprising enough to solicit preorders for Bayonetta hair extensions or Bayonetta soup dumplings, we're going to get them. Enterbrain's The Eyes of Bayonetta book isn't a crazy kind of product. It'll actually sell more than 3 copies because it's a comprehensive tome packed full of designs, illustrations, and artwork of the heroine Bayonetta, the cast of characters, locations, and the weapons featured in the game. What we're most interested in perusing through are the illustrations of characters and weapons that weren't used in the game but are featured in the book. As an added bonus, a DVD is included which contains staff commentary on the design process and how Bayonetta went from pencil sketch to full-blown action heroine. As second bonus, two foldout posters are included in the book. All preorders and new orders are shipping this afternoon at JPY3500 or US$70.90 from NCS. Pricing reflects the overnight shipping costs to import a 233-page hardcover book from Japan to the USA and the relentless rise of the Japanese yen against the US dollar. The Bayonetta book has been released by the publisher and is expected to ship from our Japanese vendors in the next few days once they receive their allocations. NCS expects to receive the books on or around July 29. We were able to buy up one distributor's extra inventory and new orders are welcome. 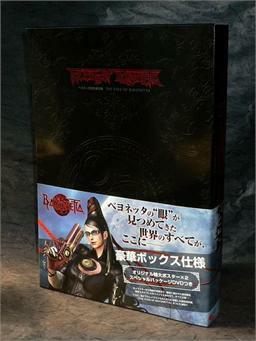 Enterbrain's The Eyes of Bayonetta book isn't a crazy kind of product. It'll actually sell more than 3 copies because it's a comprehensive tome packed full of designs, illustrations, and artwork of the heroine Bayonetta, the cast of characters, locations, and the weapons featured in the game. What we're most looking forward to are the illustrations of characters and weapons that weren't used in the game but will be featured in the book. 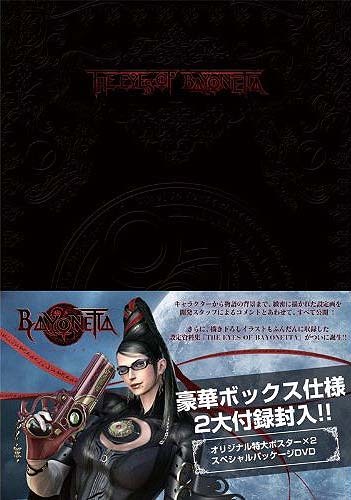 As an added bonus, a DVD is included which contains staff commentary on the design process and how Bayonetta went from pencil sketch to full-blown action heroine. As second bonus, two foldout posters are included in the book. Preorders are welcome to ship on or around July 29, 2010 at JPY3500 or US$70.90 from NCS. Pricing reflects the overnight shipping costs to import a 300+ page hardcover book from Japan to the USA. Preorders will ship on or around July 29, 2010 (delayed from June 30, 2010).